Organic pork spare rib steaks from the Riverford butchery. Cheaper than a chop or loin, but just as quick and versatile. Juicily toothsome, with a marbling of fat that naturally bastes the flesh as it cooks. Tender, big on flavour and easy to grill, fry or braise. Approximately 4 spare rib steaks per pack. You can cook these fast in a pan. 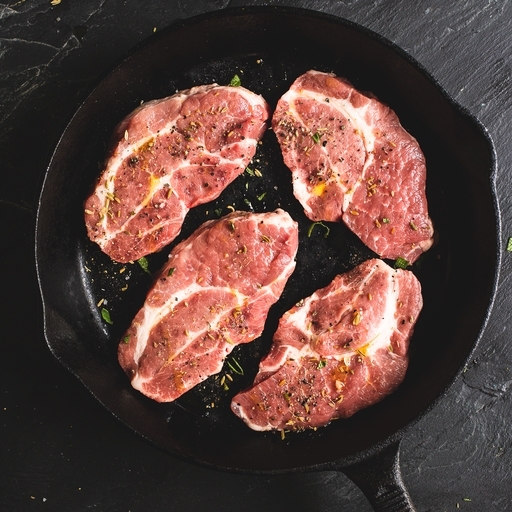 The meat isn’t as tender as a loin steak, but the flavour is deeper; it is the pork equivalent of a rib-eye steak. Season generously and brown well in a hot, oiled pan for about 3-4 mins a side, making sure it is cooked all the way through. Leave to rest for 5 mins before serving. They are also suited to slow braising into a stew, casserole or curry. Season well and brown in a pan before adding to the dish of choice, then cook very gently for 2-3 hours until completely tender.